Keith Leggett’s Credit Union Watch: Does Primary Financial Institution Impact Consumers' Choice of Mortgage Providers? Does Primary Financial Institution Impact Consumers' Choice of Mortgage Providers? Raddon Research Insights found that consumers, who identify a credit union as their primary financial institution, are more likely to go to their credit union for a mortgage than individuals identifying other financial institutions as their primary financial institutions. Eighty-three percent of credit union members, who identify their credit union as their primary financial institution, plan to use their credit union for a mortgage. 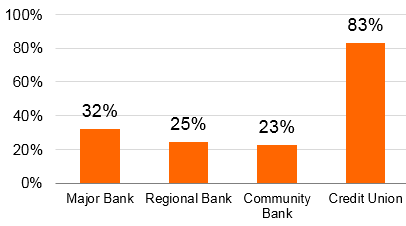 Only 32 percent of customers who state a major bank is their primary financial institution would use this major bank for a mortgage. The percentage of regional bank and community bank customers were under 25 percent.